Yummm this looks awesome Tara! Going on the menu soon. Oh my gosh, I feel like all I can talk about is the snow (I’m in MA). It’s bad and totally all consuming. And more is heading at me this weekend. Eeek. 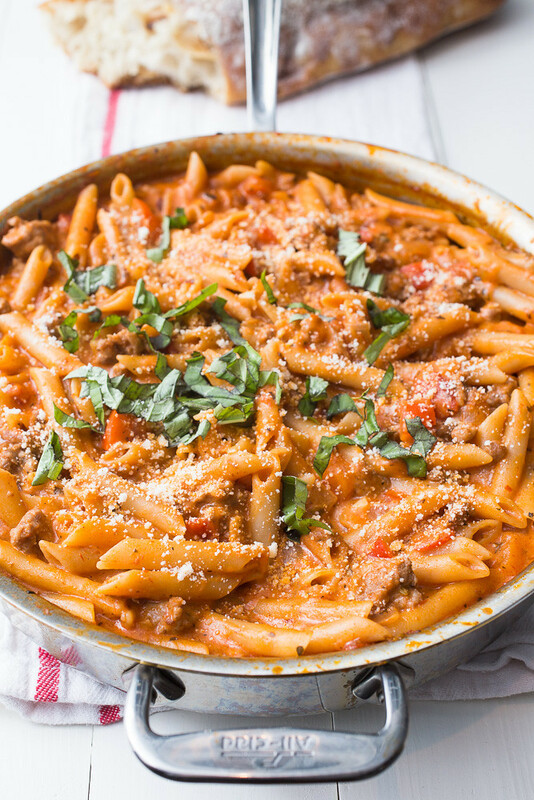 I need a big skillet of this amazing, comforting pasta to make me feel better! I so feel for you! We’ve gotten a bit here in CT but not nearly as much as you guys. This is definitely THE meal for these ridiculously frigid and snowy winter nights and I hope you love it! Great to hear! Thank you for coming back to let me know how your family loved it! I made this for dinner tonight – after a full day of work and a 60 min workout, we were still eating by just after 7pm. This dish is amazing! It is decadent and tastes like it is really unhealthy. I substituted evaporated milk for cream, with no consequence. Seriously. I don’t love a ton of pasta, but this was great. I was highly skeptical of the 4c water, but i used almost all of it. There might have been 1/8c leftover. I did use a splash more wine and a few tblsp of fresh basil at the end. I will add this to the rotation. Thank you so much for the great recipe! Oh yeah! This is by far one of the best things we’ve made in the past couple of years and I’m SO happy to hear you love it too! Great idea for a substitution – I don’t always have cream in the fridge but usually have a can of evaporated milk in the cabinet. Made this tonight and it was delicious! I used chicken stock in place of dry white wine; don’t know what the wine tastes like, but I can’t imagine it would be much better! Got some picky eaters in this household and everyone ate it up! So happy this was a big hit with your family, Jaime! The chicken stock is a great substitution for white wine and I’m sure it didn’t change the taste all that much at all. Thanks so much for coming back to leave a comment! 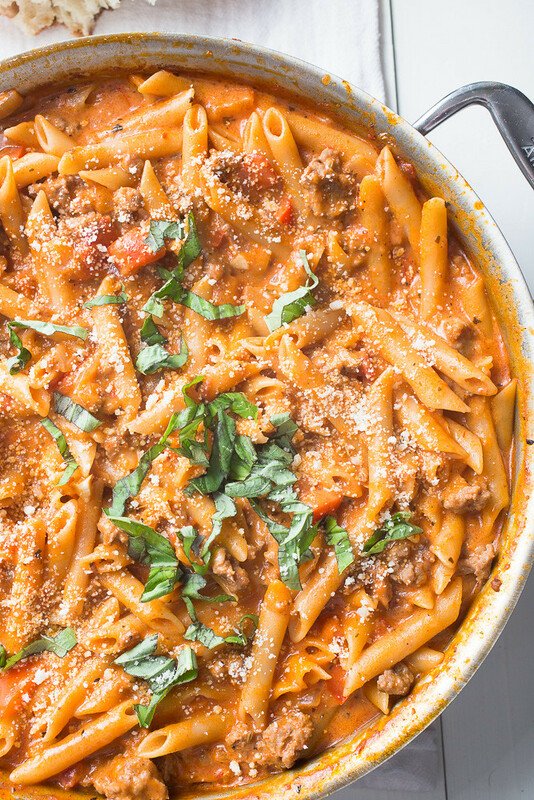 One-pot pasta recipes for when you just can't with the dishes. Cool Mom Eats weekly meal plan: 5 easy recipes for the week ahead. Awesome to hear! I love that a slightly sweet chicken apple sausage worked well since we usually have a bunch of that on hand throughout the winter! So sorry for the late response here, Isabella! I’ve got a new baby in the house and things are nutso here! 🙂 Yes, you can definitely make just the sauce but you will likely need a little water to thin it out a little – just use your judgement there. I hope you love(d) it! Any instructions if I wanted to make ahead of time and freeze it to give to an expecting mama? Hi Gretchen! I would make the recipe as is, let it cool, and then freeze it in a disposable aluminum pan covered tightly with a double layer of plastic wrap. When ready to cook, it should be thawed in the fridge (I would move it from the freezer to the fridge the night before) and then reheat in the oven or dump the pasta in a large saute pan and heat on the stove. I hope this is a hit for your friend! I made this last night. I used both hot and sweet sausage. I added a lot of fresh spinach at the end. Fabulous. My family and our guests gobbled it up! Thank you for the recipe! Oh yay!! Yes, I’ve been making it with a combo of sweet and hot – it’s a compromise for Kyle and I since he LOVES spicy food – and it’s so good. Love that you added spinach – bet that was so great! Thanks so much for coming back to comment! This was so delicious! One of my new favorite recipes! I used Tofurkey Italian sausage since were vegetarian, so, so good!! Thank you! Woot!! So glad you enjoyed this, Kristi! And so great to hear that a meatless option works so well in place of the pork sausage! Thank you SO much for coming back to say hi and let me know how the recipe went for you. Had to leave a comment to say how much I LOVED this recipe. Used three large hot sausages that I cut the casings off and crumbled, White Linen marinara sauce from Costco, and half-and-half cream, and it had amazing spicy but not too spicy flavour. This was seriously the best thing I have made in months!! Thank you for a fantastic recipe! So awesome to hear! This meal still remains one of our very favorites and I’m so happy you loved it, Brianna! I used this recipe as a guide last night when making dinner!! 🙂 I didn’t have everything on the list, so I subbed out some, but it was sooooo good! Thank you!! I did write about how I changed it on my blog, with giving your link for the original post and the actual recipe 🙂 I hope you give permission for that! 🙂 Check out familyfoodplay.com to see it! THanks again! it was a hit with my family! Just made this is it was great!! 9 year old picky eater declared it the best pasta ever. Only had half and half and no fennel. Can’t wait to try it properly! That’s awesome!! 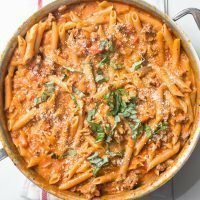 I absolutely love that this pasta is a hit with picky kids! Half and half definitely works in place of the heavy cream. Thanks so much for coming back to leave a comment! I am also reviewing this recipe tonight to prepare it for dinner for my family. I also wanted to point out that since I do not have fennel, I will substitute it with Anise Seeds which also have that licorice flavor. I will comment again to see how everyone enjoyed the dish. Thank you. Anise seeds sound like they would work great! I hope you enjoyed this dinner! So are you saying you do not cook the pasta separate, you just put it in with the sausage and other ingredients and let it cook in with that. I always cooked my pasta seperate then rinsed it to get the starch out. This has become a regular favorite for us! The only change I made is that I only use 2 1/2 cups of water rather than 4 because it’s just way to liquidy otherwise. We love to use hot sausage with ours. Delicious! So so great to hear! Thank you for coming back to let me know how your family loves this! If I substitute heavy cream with Greek yogurt, is it a 1 to 1 ratio? Hi Jessica! I’d start with 1/4 cup Greek yogurt and if you think it should be a little creamier, add a couple of tablespoons at a time until it’s as creamy as you’d like it to be. Let me know how the yogurt substitute turns out for you! Enjoy! 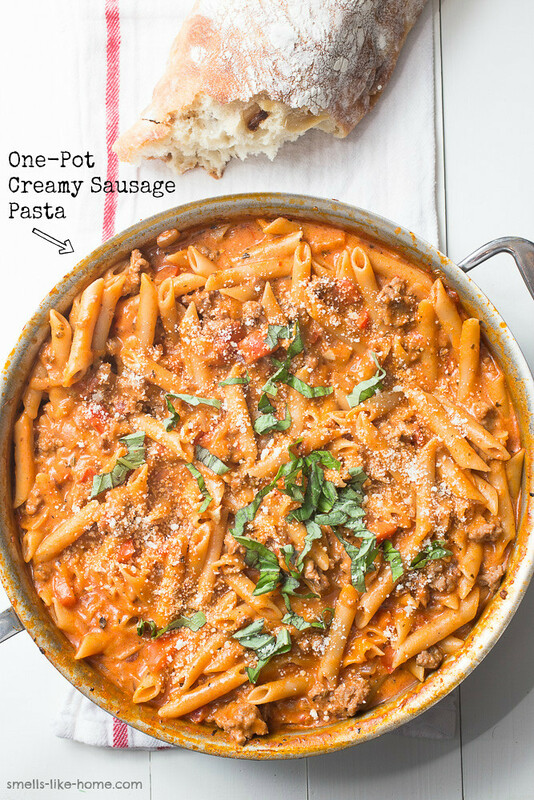 I’m thinking of adding vodka and crispy bacon….and another time it’ll be hot italian sausage….geez the possibilities are endless. Thanks for a great recipe for a fabulous meal! P.s. love all the comments it’s a great help and awesome ideas when you’re trying a meal for the first time!! Hi Diane! Yes, the possibilities ARE endless! I LOVE the idea of adding bacon and vodka. Someone on Pinterest left a comment on one of the Pins of this recipe about adding vodka and she said it turned out great. 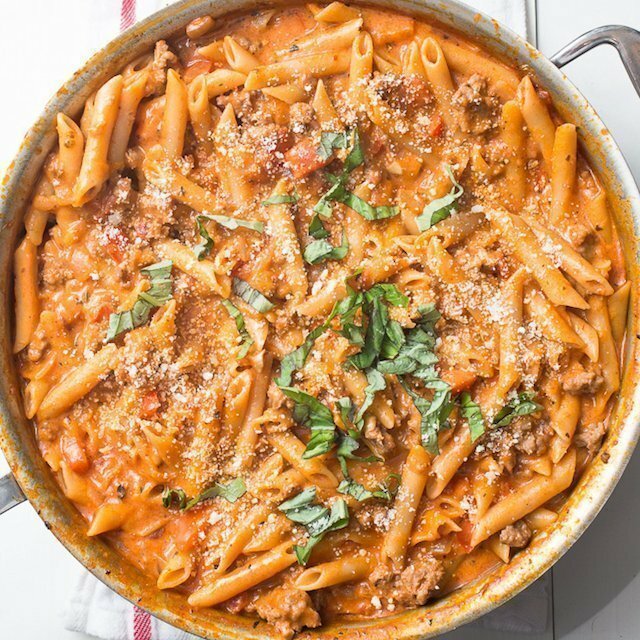 I can only imagine it would be pretty delicious (I’m a big fan of vodka sauce!). So glad the comments have been helpful to you too – this is great feedback! I made this a few weeks and my husband has been begging for it ever since! I used skim milk in place of the cream (all I had in hand in the fridge) but added in some cream cheese to get that nice smooth creamy consistency and no complaints over here! Great recipe and definitely saving for future use! LOVE the substitute suggestion, Maegan! I’m sure cream cheese was a phenomenal addition. Thank you so much for coming back to let me know how you liked it! Just tried this tonight, used a kielbasa I had on hand instead of sausage. I fed the family and had enough leftover for a couple days of lunch next week. This is absolutely going to be in the dinner rotation from now on! Perfect blend of sauce to noodle ratio. YUMMY! Yay! I love hearing this! And I love the idea of using kielbasa instead of sausage – use what ya got, right?? Thank you so much for coming back to leave a comment! This gives other readers ideas about how to adapt this recipe to make it work for their families. Have a great rest of your weekend! Mine came out with too much water. Idk what I did wrong.. any advice?? Did you follow the recipe exactly as written or did you make any changes to it? It’s hard for me know to what went wrong for you without knowing if you made changes. I just made it, and I intentionally left out 1 cup of water….but kept it handy for an emergency 😉. It seemed like an excessive amount for my liking, but I’ve been wrong before. I wasn’t wrong this time, and regardless…..it was AH-mazing!! I followed the recipe exactly except for the water, and I added fresh spinach after letting the cream heat through. Oh, and I always double the cheese, and this was no exception. Thank you so much for the recipe!!! Yay!! So great to hear your feedback on this one, Jessica. Yes, the amount of liquid can be tricky but I’m glad you went with your instinct – that’s your best guide sometimes. Love your addition of spinach too! It’s a delicious and easy add-in, especially if you’ve got some leftover in the fridge (ahem, like me, always). Thank you so much for coming back to leave a review! I found this recipe a couple of months ago and it’s now one of my go-to recipes. The adults sprinkle the red pepper flakes in their own bowl and everyone but dad sprinkles the fresh parm in their own bowls. We all love this meal. Thank you! Hi MaryAnn! This is SO great to hear! Since we have a toddler in the house now, we also skip adding the red pepper flakes to the sauce and opt to sprinkle them on when serving too. Oftentimes, I don’t put them on at all and I honestly don’t even miss the flavor. Thank you so much for coming back to leave a review!